Philips has a great line of shavers for men but they also have something for men who like to maintain the latest beard styles too. 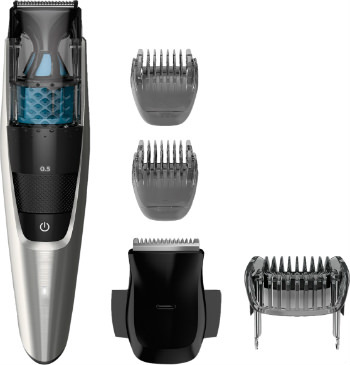 The Philips Norelco Beard Trimmer Series 7200 BT7215/49 is a kit that will enable men to trim their beard, mustache, sideburns, and other facial hair styles easily. 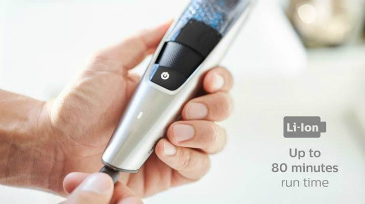 This dry trimmer is cordless and rechargeable. This beard trimmer is designed in a black and grey plastic case. It’s narrow and tapers down to the bottom. There is a trimmer and three grey plastic trimming combs to help you select the right hair length. About a third of the way down is a blue dial which helps you to select the length, which is displayed as a number below that. The on/off button is about two thirds down the front. There is a clear plastic reservoir with funnel that collects the hairs at the top. It’s handy to have, as you won’t have to clean up hairs from your sink or counter, or the floor after doing a trim. Simply open up the tiny door and empty the whiskers into the garbage. 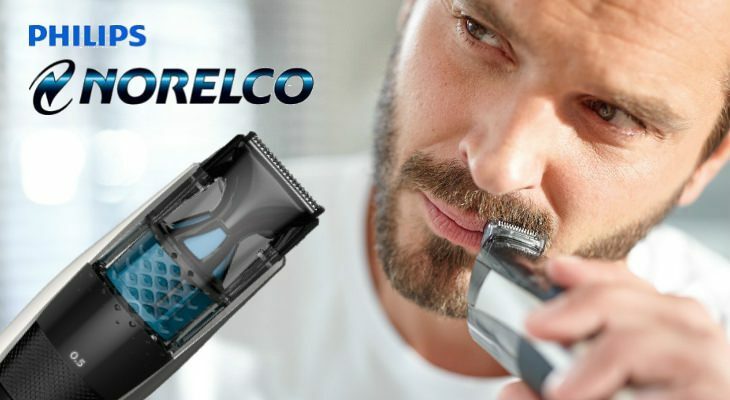 The blades of the Norelco Beard Trimmer are designed with an innovative lift and trim technology. The trimmer lifts up the hairs first, guides them to the blades and then snips them off. This results in a more efficient trim. The blades built within this trimmer have self-sharpening steel blades. This means that the trimmer will always cut as well as it did when you first removed it from the box. This also prevents skin irritation, as dull blades are bad for the skin. 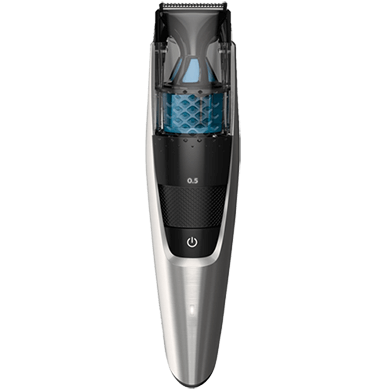 The blades are also double sharpened which will help them to trim more hairs in each pass of the beard trimmer, and this will result in a faster trim. The steel of the blades will also help to minimize irritation as they don’t contain any nickel, which is a metal known to cause skin irritation. With the use of the attachable hair combs there will be twenty different built-in length settings which are enough to give a man their own personal trim, so they don’t look just like any other guy who has also purchased the same trimmer. To select your trim setting you simply turn the blue zoom wheel until you have reached the length you want. Lengths are displayed from 0.5 mm to 10 mm. The other two combs do 3 mm and 5 mm. 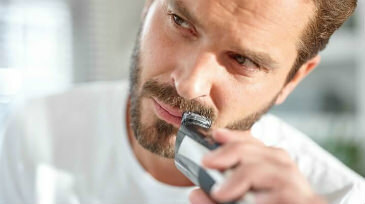 The Philips Norelco Beard Trimmer Series 7200 is perfect for men who have previously tried to trim with just scissors and a comb, only to result in uneven results. The hair combs make it easier to get a great over-all even trim, and also provide a skin-friendly solution which is much safer than trimming hair with sharp scissors. 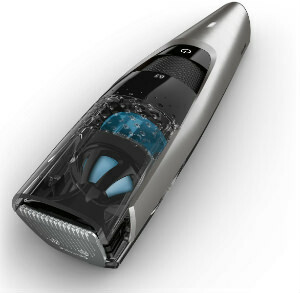 This trimmer is powered by a lithium ion battery. This is the best battery to have for high-performance facial trimming. 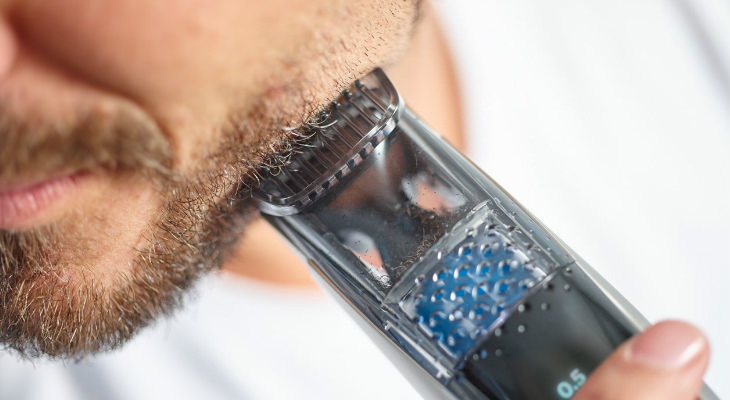 It takes one hour to fully charge up your beard trimmer. One full charge will give you eighty minutes of cordless trimming time. If you forget to charge it up, or prefer, you can also operate it with the cord attached. There is a power battery indicator on the front of the trimmer, just below the on/off button. 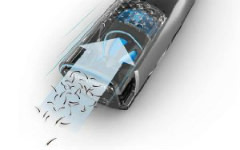 While you can’t use the Philips Norelco Beard Trimmer Series 7200 wet, only dry, you can remove the trimmer head and the plastic combs so they can be rinsed under the tap. This will help to get out any stray hairs that the vacuum system didn’t collect. Simply wait for the trimmer head to dry, and then reattach it by clicking it on. The combs can be dried with a towel. You can also empty the hair reservoir under the tap too, to get out all the hairs. There is also a cleaning brush included in the kit, so you can be assured that it’ll be perfectly clean before using next. 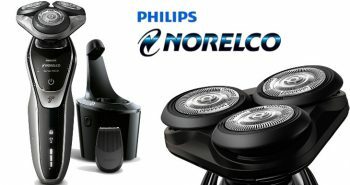 Philips Norelco has four popular beard trimmers in their line: 3500, 5100, 7200, and 9100. You may wish to do a quick comparison before buying. 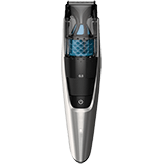 The 7200 is the only one of the three that has a vacuum hair system. The 5100 and the 9100 trim down to a lower level of 0.2mm. Only the 3500 and the 7200 have twenty different length settings. All four have a zoom wheel to choose the optimum length. The 5100 and the 9100 are fully waterproof, for men who like to trim in the shower. 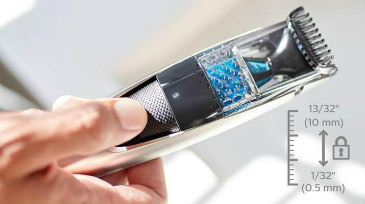 The 3500 offers a longer chargeable shaving time of two hours. The 5100 will trim to longer lengths of 13mm. All four trimmers have a lithium ion battery. Each of these 4 trimmers is great, it’s just a man’s personal choice of what length settings he needs, and whether the waterproof function is important to him. 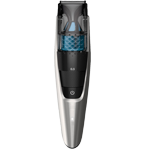 But the 7200 is the only one to have the vacuum hair feature which is handy to have. The cost of this hair trimmer is under $55, making it an affordable second purchase to your grooming kit. In the box you’ll get one Philips Norelco Beard Trimmer Series 7200, three beard combs, and a cleaning brush. The Philips Norelco Beard Trimmer Series 7200 BT7215/49 comes with a five year warranty, which is actually exceptional for a product of this type. The package measures 2.4” x 5.9” x 10.4 inches and weighs 13.6 ounces. 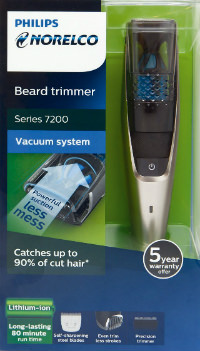 For its additional features, the Philips Norelco Beard Trimmer Series 7200 BT7215/49 is a great deal. It’s also backed up by an excellent warranty. Skip past those cheaply branded hair trimmers and buy a quality one made by Philips.